Welcome back to Messier Monday! 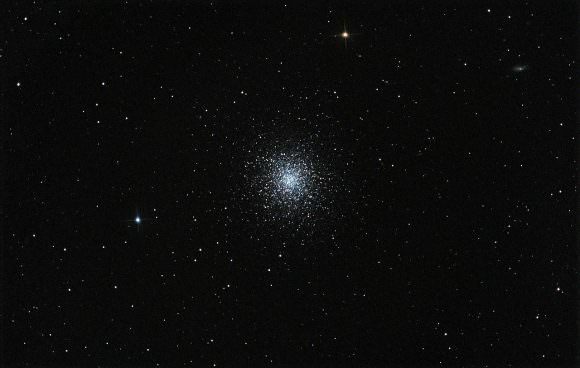 Today, in our ongoing tribute to Tammy Plotner, we take a look at the M14 globular cluster! One of these objects was the globular cluster which he would designate as M14. Located in the southern constellation Ophiuchus, this slightly elliptically-shaped stellar swarm contains several hundred thousand stars, a surprising number of which are variables. Despite these stars not being densely concentrated in the central region, this object is not hard to spot for amateur astronomers that are dedicated to their craft! Located some 30,000 light years from Earth and measuring 100 light years in diameter, this globular cluster can be found in the southern Ophiuchus constellation, along with several other Messier Objects. Although it began its life some 13.5 billion years ago, it is far from being done changing. It is still shaking intracluster dust from its shoes. Messier 14 can be found by first locating Delta Ophiuchi, which M14 is located at about 21 degrees east and 0.4 degrees north from. It can also be found about one-third of the way from Beta to Eta Ophiuchi. If you know where Messier 10 is, take a look 0.8 degrees north and 10 degrees east of it to find M14. The cluster can also be located along the imaginary line from Cebalrai, an orange giant with an apparent magnitude of 2.76 and the fifth brightest star in Ophiuchus, to Antares, the bright red supergiant located in Scorpius. With an apparent magnitude of +7.6, M14 can be easily observed with binoculars. For those using small telescopes, the bright center and faint halo can be viewed, whereas 8-inch instruments will reveal the cluster’s elliptical shape. To resolve individual stars, you will need a 12-inch telescope or larger. The best time of year to observe the cluster is in the months of May, June and July. Welcome back to another edition of Messier Monday! 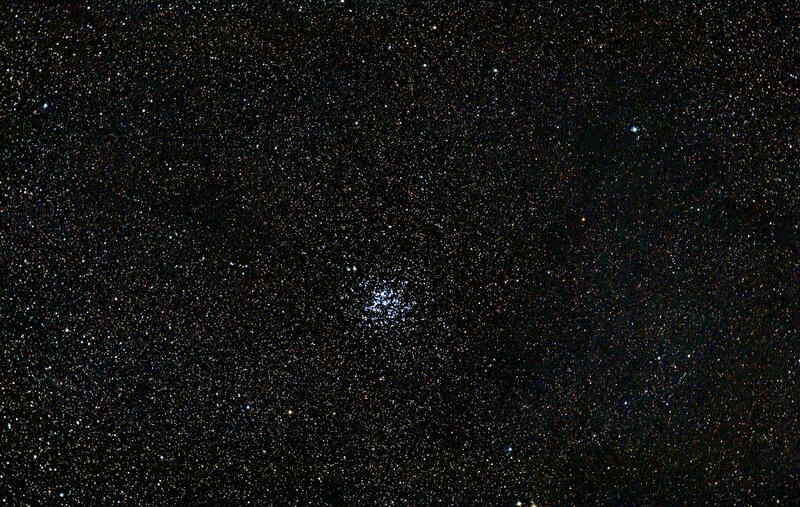 Today, we continue in our tribute to Tammy Plotner with a look at the M11 Wild Duck Cluster! In the 18th century, French astronomer Charles Messier noted the presence of several “nebulous objects” in the night sky while searching for comets. Hoping to ensure that other astronomers did not make the same mistake, he began compiling a list of 1oo of them. This list came to be known as the Messier Catalog, and would have far-reaching consequences. One of these objects is M11, otherwise known as The Wild Duck Cluster, an open cluster located in the constellation Scutum, near the northern edge of a rich Milky Way star cloud (the Scutum Cloud). This open star cluster is one of the richest and most compact of all those known, composed of a few thousand hot, young stars that are only a few million years old. Welcome to another installment of Messier Monday! Today, we continue in our tribute to our dear friend, Tammy Plotner, by taking a look at Messier Object 10. During the late 18th century, Charles Messier began to notice that a series of “nebulous” objects in the night sky that he originally mistook for comets. In time, he would notice that they were in fact something significantly different. With the hope of preventing other astronomers from making the same mistake, he began compiling a list of these in what would come to be known as the Messier Catalog. Consisting of 100 objects, the catalog became an important milestone in both astronomy and the research of Deep Sky objects. Among the many famous objects in this catalog is the M4 loose globular cluster (aka. NGC 6121). Located in the Scorpius (Scorpio) Constellation, this great cluster of ancient stars is one of the closest Messier Objects of its kind to Earth.